Woohoo! It’s the home-stretch for my version of this three-day recipe for carrot cake with ice cream. They certainly don’t make things very easy do they? When I saw the name of this component recipe, I naturally thought of the artist R. Crumb. Have you heard of him? He’s kinda dorky, but famous. 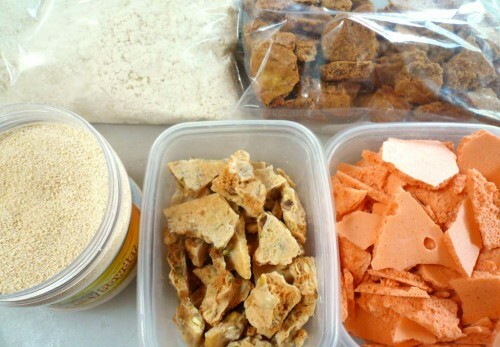 Just dried honey and sucrose in a granular, powder form. The granules are about the size of a pinhead. It’s also called granulated honey. 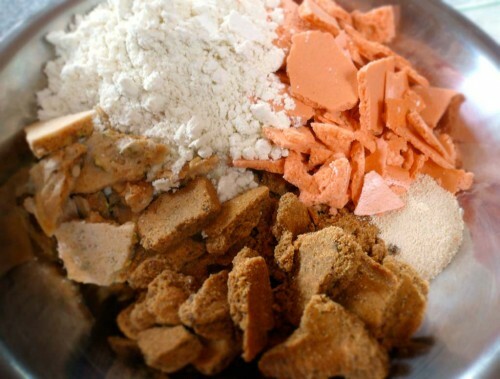 There are other forms too, honey mixed with maltodextrin is called spray-dried honey and honey powder. There is also something called cactus honey powder, which is not honey — but dried blue agave nectar. I use natural agave nectar in teas instead of sugar. It’s also a necessity for really good margaritas! Just make sure to check the ingredients before you buy. Honey granules can be found online here and here, in finer grocery stores, health food stores and some Asian markets (near the teas). I pulsed several batches of pistachio shortbread, brittle and crispy carrot foam in my mini food processor until finely powdered. Then mixed thoroughly with the pistachio powder and some honey granules. I found some Medjool dates at North Park Produce, a favorite market of mine for Middle-Eastern and Indian cuisine ingredients. 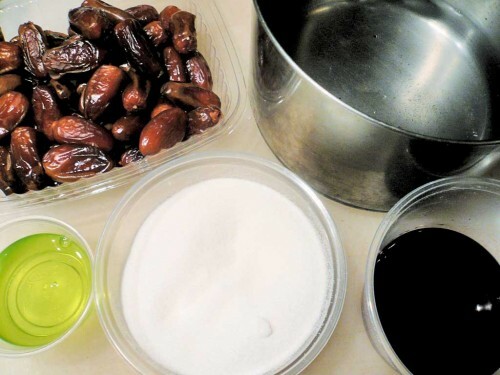 I covered the dates with hot water and let soak, until their skins would rub off easily. Then I peeled and pitted them. I found it helped if I peeled their skins off under running water. 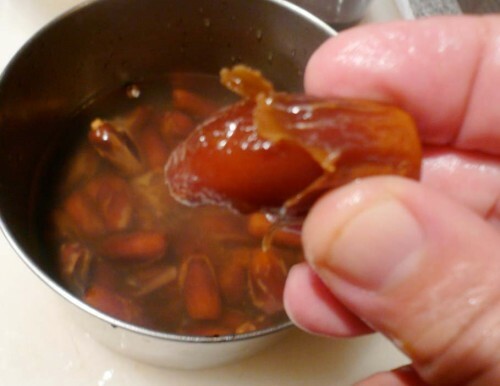 In a medium saucepan, I combined the pitted dates, water, sugar, Port wine and a touch of salt, and brought to a boil. I simmered them, covered, for half an hour, until they were tender. Then I puréed the dates with some of their liquid in my Oster blender. While it was still running, I slowly drizzled in the grape seed oil. This thickens up the purée, emulsifying as it heats up from the friction of the blender. 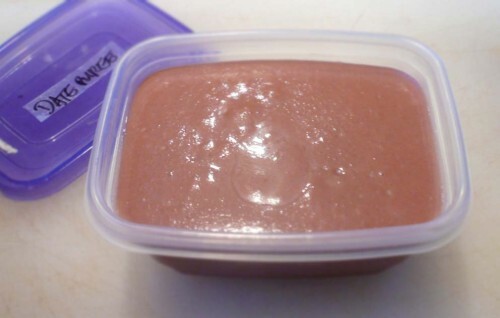 I strained the purée, transferred it to a plastic container, and reserved to my prep area. 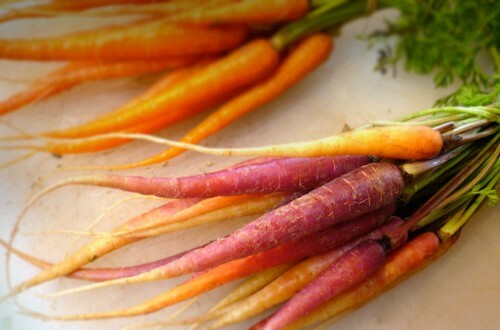 When I was at the local farmers market, I spotted some baby Purple Haze and heirloom carrots, in all their multi-colored glory. The last bunch on the table. They were perfect for this recipe, so I had to have them. Evidently they looked just as appealing to the woman behind me, who grabbed for them at the same time I did. Hmmm. Foodie fisticuffs? Blogger brawl? Hipster mayhem? Almost, but no. 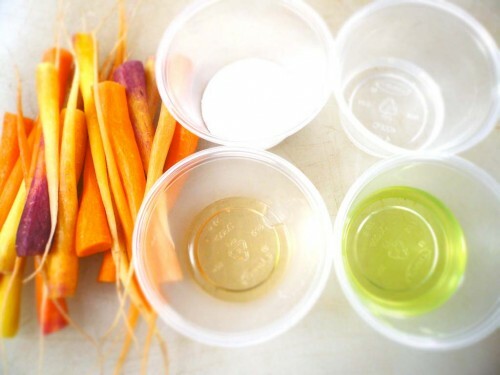 I just used my best “laser-eye” look I learned from my teenagers, and it momentarily stunned her enough for me to bag the delicious little veggies. 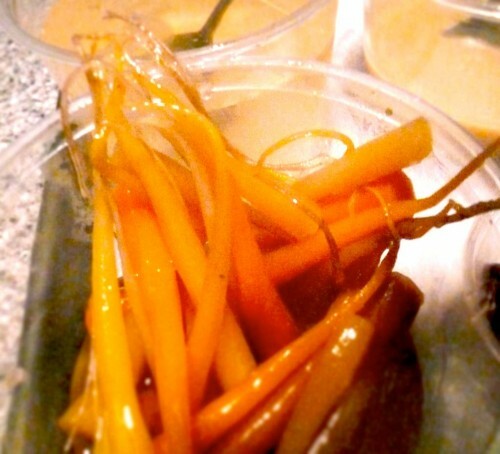 First, I trimmed off their tops, then peeled the carrots — leaving their roots. 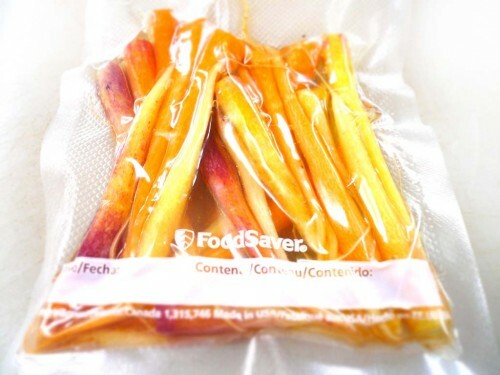 Then I sealed them, the grapseed oil, sugar, honey and a touch of salt in a bag with my FoodSaver vacuum sealer. Cooked en sous vide for 10 minutes at 185ºF. Then removed, and plunged into an ice bath to stop the cooking. I’m learning more about sous vide from Thomas Keller’s book Under Pressure, more than from the Alinea cookbook. The minimal directions in the latter imply that you to know certain things about cooking in general, and sous vide particularly. Not an exhaustive text, but that’s okay. It’s not meant to be. To reduce the Fuyu persimmon’s astringency, the recipe calls for Pineau des Charentes, a sweet desert wine from France. 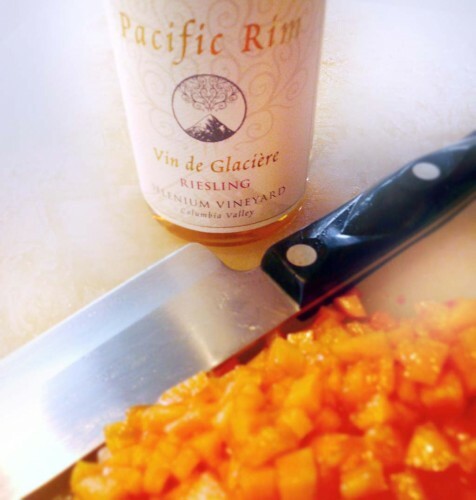 I decided to use some Pacific Rim ‘Vin de Glaciére,’ a nice sweet Reisling from the Columbia Valley. 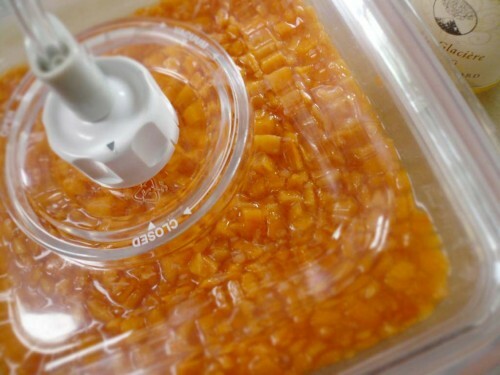 I used the container attachment to my FoodSaver vacuum sealer to compress the wine and persimmons, then refrigerated. 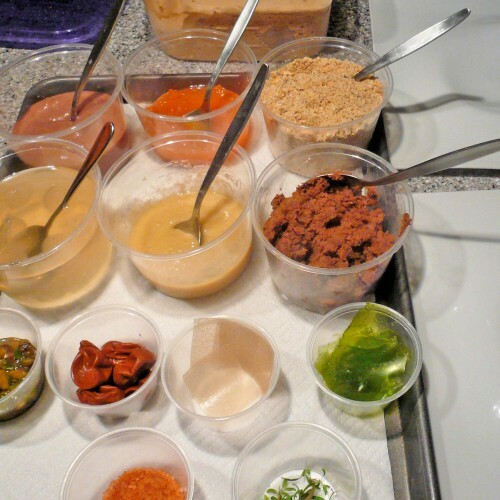 I warmed some of the persimmon cake, and gathered my mise for service. The recipe calls for Bali sea salt. 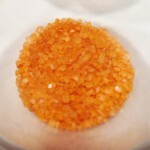 I had none, but I did have medium-grained, Hawaiian Alaea sea salt, from Vien Dong World Foods Market. Close enough. I put a dollop of date purée in the divot of the plate and topped with braised pistachios, hyssop leaves and Alaea sea salt. 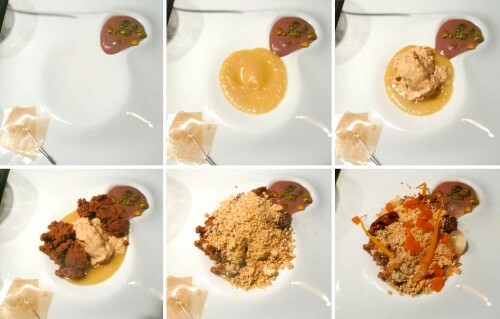 Then I added a ‘base coat’ of verjus sauce to the plate, a scoop of the caramelized ice cream, two pieces of persimmon cake, and topped with the crumbs. Around the plate I placed some raw persimmon dice, a couple ginger spheres, a curry raisin, and a piece of the hyssop glass. Garnished with hyssop leaves and an aroma strip skewer. Wow. 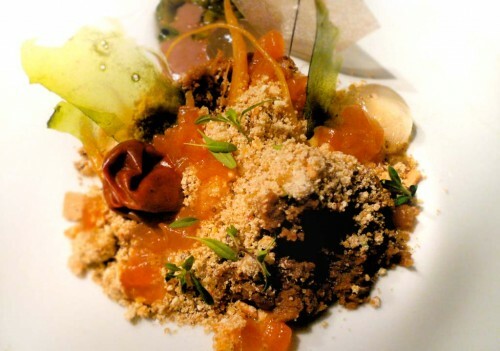 This was one of the most complex, and best tasting dishes from the Alinea cookbook so far! A fabulously presented dessert of cake and ice cream, with the taste of sweet fruit, shortbread and gingerbread cookies. Yuh-UMMM! Nice and very dedicated work — as usual Martin. I’ve always been curious about the “raisins” in this recipe. Do they have a good texture? Are they similar to raisins or they are just hollow inside? I love the complementary colors and textures of all the many varied components. It’s always amazing to read through all the detailed steps and watch how they come together. 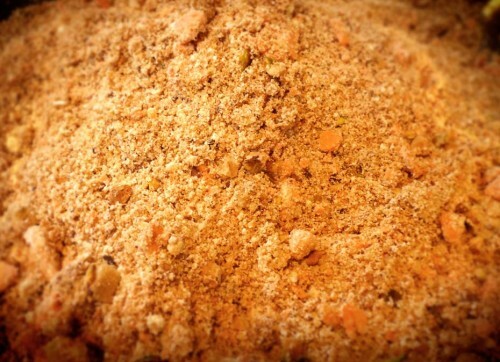 All that work with the cookies, brittle, crispy carrot foam, and pistachio flour, and you then end up crumbling them all into a powder melange? !